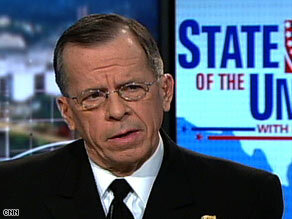 Iran likely has enough material to make a nuclear weapon, U.S. Joint Chiefs of Staff chairman Adm. Mike Mullen told CNN’s John King Sunday. “We think they do, quite frankly,” Mullen said on “State of The Union.” “Iran having a nuclear weapon, I believe, for a long time, is a very, very bad outcome for the region and for the world,” he said. However, Tehran has denied pursuing nuclear weapons and insists the country’s nuclear program is for peaceful purposes only. Mullen also said he is watching North Korea closely, although he added that he and Defense Secretary Robert Gates have yet to make a recommendation on how to approach that country. “There has been no recommendations one way or another,” he said. “There’s a lot of focus on this and then recommendations and certainly policy discussions will come based on the timing and what North Korea does.” Mullen’s comments on Iran came days after a Washington think tank said Iran had enough uranium for a bomb. The Institute for Science and International Security released a report in late February concluding that Iran has reached “nuclear weapons breakout capability.” The report was based on an analysis of data from the International Atomic Energy Agency, the U.N. nuclear watchdog agency. However, an IAEA official who asked not to be named cautioned against drawing such dramatic conclusions from the data, saying Iran’s stock of low-enriched uranium would have to be turned into highly enriched uranium to qualify as weapons-grade material. That hasn’t been done, the official said.